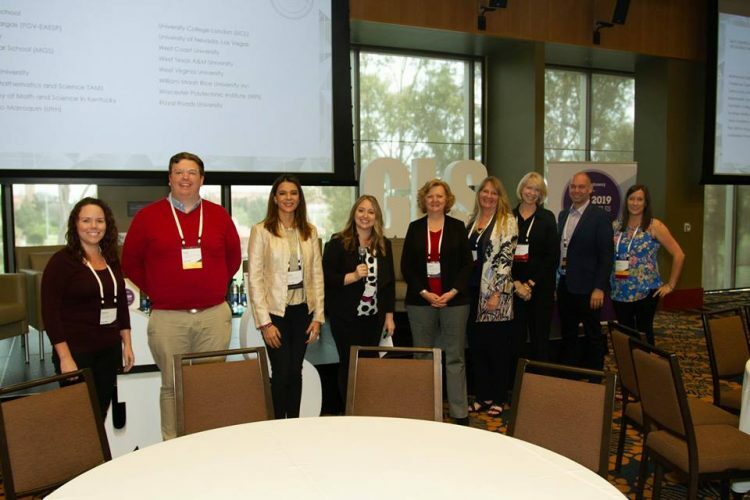 Christine Harriger and Kristin Dabney were recognized along with representatives from other Silver Award-winning institutions at the Graduway Leaders Summit in Los Angeles. Last week, Randolph College was recognized by Graduway as a Graduway Champion and Silver Award Winning User for its new networking platform, RandolphConnect. Christine Harriger, director of career development, and Kristin Dabney, alumnae and alumni career network manager, accepted the awards at the Graduway Leaders Summit in Los Angeles. The Graduway Leaders Summit is a gathering of leaders with the focus on best practices in alumni relations and career mentoring. It provides the opportunity for attendees to listen to the industry’s thought leaders, share alumni relations best practices, and develop professionally and network. In addition to accepting the awards, Harriger and Dabney made the presentation, “It Takes a Village: Building a Bridge Between Career & Alumni Services.” In the presentation, they discussed the partnership between Randolph’s Career Development Center and Office of Alumnae and Alumni and the process of launching RandolphConnect. Harriger and Dabney will also make a presentation at the Virginia Association of Colleges & Employers (VACE) conference in Virginia Beach later this month. This is not the first time Randolph has received national recognition for RandolphConnect. At Graduway’s 2018 Global Leaders Summit in Boston, Randolph earned the Outstanding Network Launch Award for its successful launch and rapid member growth. RandolphConnect, which is powered by Graduway, is an online community where Randolph’s vast network of alumnae and alumni, current students, parents, faculty and staff, and other friends of the College can share information, job postings, and other College-related updates. The platform has been upgraded since its initial launch, and now includes a new mobile app as well as other features. Sign up today at www.randolphconnect.com.